X-ray style art is one of many art forms traditional made by the Indigenous peoples of Australia. Indigenous Australian art, also known as Australian Aboriginal art, includes a vast array of art forms – such as wood carving, rock carving, sculpting, leaf painting, dot painting, sand painting, and more – and some of it is x-ray style art. X-ray style art was created prior to European contact and the production continued through the colonization era and into our time. There are still Indigenous artists in Australia that make x-ray style art. When it comes to rock painting, x-ray style art is known from the Arnhem Land and Kakadu National Park regions of the Northern Territory. Here, skeletons and viscera of animals and humans are traditionally portrayed by drawing inside the outline, as if by cross section. The female form, especially the female womb, drawn in x-ray style is a common motif at some of the famous sites in Arnhem Land. Arnhem Land is one of five regions that make up the Northern Territory of Australia. With its roughly 97,000 square kilometres, Arnhem Land is larger than the U.S. state of Indiana, but home to only 16,000 people. Of these approximately 16,000 residents, roughly 12,000 are Yolngu, the aboriginal owners of this region. The Kakadu National Park is a protected area within the Alligator Rivers Region of the Northern Territory. With its 19.8 square kilometres, the park is roughly the same size as the European country Slovenia. Within the park, you’ll find the Aboriginal art sites Ubirr, Burrunguy (Nourlangie Rock) and Nanguluwur which are all recognized as outstanding examples of Aboriginal rock art in Australia. Examples of animals depicted in the main gallery of Ubirr are a snake-necked turtle, pig-nosed turtle, wallaby, thylacine (a now extinct carnivorous marsupial), rock-haunting ringtail possum, Asian sea bass, mullet, catfish, and goana (a type of monitor lizard). One example of a contemporary artist who is carrying on the Australian legacy of x-ray style art is Leslie Nawirridj, who lives in Arnhem Land and creates in the style of the Kunwinjku Aboriginal people. Examples of animals that he often depicts are kangaroos, crocodiles and echidnas. You can buy his art here. The ancestors of the Kunwinjku painted x-ray style art on the rocks of Western Arnhem Land, using a type of fine-line cross-hatching known as rarrk. Nawirridj carries on the tradition of rarrk even though he tends to paint on canvas, not rock. 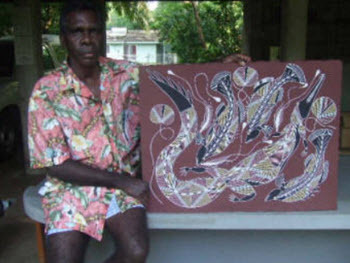 On Saturdays, Nawirridj sells his paintings from his stall at the Parap Village Markets, a group of art and crafts markets located in Darwin. His artworks are also available for purchase online at kunwinjku-aboriginal-art.com.